Many of the people from the Paws 'N Effect Agility Group, who call the Superdog Spectrum home, competed at the AAC Agility Trial held at Wet Creek Stables (near Airdrie, AB) on the first weekend in January. Shannen Jorgensen, the Spectrum's Agility Instructor, reports that she is VERY proud of the accomplishments of her swarm of Papillons at the trial. "Sizzle, in her first AAC trial, accomplished WAY more than I ever expected" said Shannen. "She earned her ADC (Agility Dog of Canada) title in 3 straight runs! Never before have I had a dog complete a title at their first trial like that." Shannen went on to say that Sizzle is an incredible little dog and, since she just turned 2 years old, she is expected to have a great career ahead of her. Sizzle also earned her starters jumpers title and her starters snooker title at the trial so Shannen will be adding her name to the list of dogs she will be taking to the US National Papillon Specialty to in May in California. 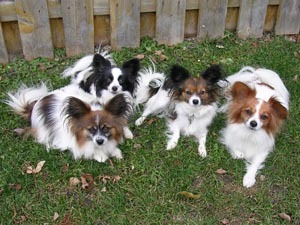 "With 4 Canadian dogs there, we stand a great chance at some big winning!" says Shannen. Target, the Papillon that has taken Shannen to competitions in France and Italy, qualified in every round at the Wet Creek Trial and won the money for the fastest clean run in Steeplechase. The Steeplechase class is open to ALL dogs in ALL jump heights, and Target beat them all...including all the Border Collies! Then theres Keon, another of Shannen's Papillons, who finished his Advanced Games Dog of Canada title (AGDC) with a beautiful snooker round. Overall, it was an incredible weekend for Shannen and her swarm of little butterfly dogs. "I am more than proud of my fur kids...now, on to the next trial!" Other Paws 'N Effect members...Dragonfly, a Sheltie owned by Lisa Bailey, got his ADC (Agility Dog of Canada) title and Sophie, who actually belongs to Lisas mom, got her Masters Team title. Lahni with Abby, Penny & Wayne with Cactus & Boo, and Jack Jorgensen with his cattle dogs...all turned in outstanding qualifying runs at the trial and we hope to have write-ups on their accomplishments soon. A good training facility will allow you to observe a class before you make the decision to sign up for a course. Be sure to observe how the instructor interacts with dog owners, and of course, the dogs themselves. Also note whether the instructor provides clear explanations for each lesson, and whether there's enough time for owners to practice with their dogs. After the class, talk to the other dog owners to get their perspective on the class. Ask the instructor about the types of tools or training methods they use, to ensure they're using positive training methods. Don't go to a trainer who does anything to cause a dog pain or distress in any shape or form. Is the instructor a member of a recognized training organization or association? Don't be shy about asking for credentials. Does the instructor continue his or her education by attending clinics or workshops, on an ongoing basis, so they're always on top of the latest training techniques? Choose a trainer that has strict guidelines about the health of all dogs in the class. Ask if the dogs are required to have all up-to-date vaccinations. Does your trainer have experience training your specific breed? Once you've narrowed down your search, the ultimate deciding factor will come down to chemistry. If you like the instructor's personality, and he or she gets along well with your dog, then let that help you make your final decision. The fact is that chewing is an involuntary response for dogs. Their jaws were genetically built to chew, rip and tear flesh off the bone of another animal. These days the domestic dog has little need or opportunity to hunt for its dinner because the leader of the pack (that would be you, by the way) has already hunted at the nearest store for a great dry dog food. In compromising situations, dogs depend on their instinct to tell them what to do. Being a pack animal, a dog can become stressed, upset, fearful or lonely when left alone. In these situations his instincts to chew can come to the forefront, possibly doing damage to the dog's surroundings or himself. If you're aware of your dog's reasons for chewing, you may be able to stop them. Lack of structure: Dogs need training and guidance to feel a sense of fulfillment. Obedience training, playtime and a consistent schedule gives your dog a structure and balance in her life. Staff at the Superdog Spectrum can be very helpful in suggesting training classes appropriate for your dog. Teething: Young dogs and puppies go through a stage (usually 4-6 months) where their baby teeth fall out and their adult teeth grow in. This can cause the puppy to chew on everything in sight, spike a fever and not eat their food. Give your dog's favorite chew toy a name, and use it consistently. When your dog is chewing on something inappropriate, tell him to find his toy, and refer to it by its name. When he finds the toy, give him lots of praise. Freezing a wet rope chew toy or a wash cloth for your puppy to chew on, when he is confined, can give him some relief for his sore gums. Diet: The dog must be on a high quality diet so that he can receive all the nutrition he needs from a balance of protein, carbohydrates, fats, vitamins and minerals. Check with your pet care professional about what food they might recommend for your dog. Stressful confinement: Dogs do not need a large house to make them feel protected. In fact too much freedom of space can cause stress and anxiety. In the wild they live in very small dens, their crate or a small room fenced off is a good place for the dog when you're not home. Exercise: Dogs need exercise to keep their muscles firm and to burn off excess energy. It isn't the quantity of time but the quality of time. Run, play and be active with your dog and do it every day. Two or more days per week at the Superdog Spectrum Dog DayCare will help to ensure your dog gets adequate exercise and socialization. How much is enough? Watch your dog. He'll let you know. Anxiety, fear and boredom: Dogs need structure in their lives. If they're not taught what to do when they are alone they become anxious, fearful or bored and will find something (like a brand new pair of Reebok's) to chew on and keep themselves occupied while you are not present. As the owner and leader of the pack you need to give them something safe, such as a hard rubber toy or durable nylon bone to keep their mind occupied until you return. The need to chew and how to control it: Dogs' instincts will cause them to chew anything even if that means something that reminds them of their owner. The use of a variety of toys or bones, physical and mental exercise (obedience training, agility, etc.) and a consistent and loving family pack will help your dog understand his toys and bones are what he should chew on anytime the urge to chew occurs. Don't give your dog objects to chew that are similar to objects you don't want chewed. Your dog doesn't know the difference between new shoes and old shoes. Can Your Dog Come Out To Play? A lot of what dogs do is dictated by their many natural behaviors. They have a play drive (usually exaggerated at an early age), a prey drive for hunting, and a sexual drive for mating. Though it may seem like they also have a "keep you up all night barking" drive, the fact is that their behavior is normally tied into one of the above motivations. One of the earliest theories of the purpose of play is that it allows the puppy to acquire the motor skills and coordination necessary for long-term survival. Although some puppies play rougher than others, play is important for a dog's well being and comes to them instinctively. Puppies learn to play first with their littermates, which is one of the many reasons it is important not to separate puppies from their pack too early. They usually learn some control through this process, including how long to play, how rough to play, and what degree of nipping they can use on the other pup. This process is important but it isn't all the teaching they need-not by a long shot. You and your family members aren't dogs, so when puppies come home they should learn to play with their human family differently. The human playtime usually consists of some sort of toy to encourage the dog to catch, fetch, pull, tug and chew. Most dog owners use toys throughout their dog's life... to relieve stress from being alone part of the day, to exercise a very energetic pup, to relax them and calm them down. It may surprise you to learn that the life of a dog actually has any stress. But you must remember that a dog's brain is different and they could be feeling anxiety based on fear of their confinement, too much space to roam and cause trouble, not enough exercise, being left alone for long periods of time or a number of other factors. Easy as it seems, a dog's life isn't all bones and tail-wagging. In almost all cases, the daily stress can be relieved with a play activity where the dog uses their instincts and learned behaviors to alleviate their excess energy. You'll be amazed how much happier your dog (and you!) will be with a regular dose of play time. 1. The use of appropriate toys for your dog is very important. Not every dog prefers a tough nylon bone or a hard rubber toy. Some enjoy the soft, squeaky stuffed animal-type toys, while others would rip them to shreds after squeak number one. Find toys that fit your dog's needs and preferences. 2. Control their playtime by having rules that both you and your dog understand. The rules should include the courtesy of not invading each other's space, not biting the hand that feeds them, and not playing a game that could cause you or your dog to get injured. Do not play tug-of-war if your dog tries to maul your hand and the rope toy with it. Remember: It's mostly about the tug, not the war. 3. Play safely with your dog by not pushing their physical abilities too far. For instance, a pug's pushed-in face causes them to breathe differently, so be careful not to have your pug play fetch for an hour in 90 degree heat. Dog's will usually do what you ask them to, so it's up to you to not ask them to do anything dangerous. 4. To reinforce an owner's leadership role to their dog, one should have special playtime toys to bring out when the owner wants to initiate play. This will not only allow your dog to realize that your dinnertime is not time to play catch with you but it will also reinforce to your dog some manners. A well-mannered dog understands when to go retrieve a toy and play by himself. The owner should make special time every day to play with their companion--they can't wait! 5. When selecting playtime toys pick different types for physical exercise and others for mental exercise; for this, get a selection of toys they can grab, chew and relax. Playtime is very important to your dog's well being and can strengthen your companionship. Remember a tired and relaxed dog is a good dog! Well Tailwind attended the 2nd tournament of the season with 2 teams, our division 1 team Tailwind placed 5th each day with a fastest time of 19.28sec. We were quite pleased. Tailspin finished 1st in Div. 3 on Saturday and 3rd in Div 2 on Sunday. All the dogs ran exceptionally well and reached a few milestones, Eddie (JRT) earned his Onyx title (20000 pts. ), Cougar her Flyball Master Title (5000 pts. ), and Joey earned his Flyball Champion-Gold (2500 pts.). Dogs earn 25pts for every successful race run under 24 sec. Buddy (JRT) ran a 5.54sec. on the last race of the last day, I always knew he had it in him. The next tournament is going to be held in the Edmonton region and we will be sending Tailwind up for the Saturday. Flyball 2 has also started and all the dogs and handlers are doing a great job, I see a new team in the future. Tailwind flyball Club is also putting out a call for height setters (they set the heights of the jumps). So if you have an energetic puppy, Jack Russell, Papillion, Mini Schnauzer, Terrier, Staffy, or any crazy All Canadian breed that likes to run and looooves tennis balls, please consider flyball it is a great way to burn off all that excess energy. Dont forget to check us out at www.flyball.com/tailwind.